I volunteer with Citizens for Forest Service Roads clearing these roads each spring providing access to the upper trails. Our leader just sent out the first update of 2019, thought I would share. Forest Service Roads were found as follows from up-valley down. 32 Road (Hannegan) _ Blocked by snow berm barrier at MP 0.04 to allow use by ski and snowshoe pedestrians. Parking available in the Shuksan Day-use Picnic Area though the maneuvering/turnaround area was slushy and rough. 34 Road (Nooksack) _ No accessible by motor vehicle at the moment. 3070 Road (Razorhone) _ Gated at MP 0.06, Lower Salmon Ridge Snopark is plowed open and is bare in a few spots but mostly covered by slushy snow with some standing water. The main ski trail was reported last groomed March 11. 3071 Road (Anderson Creek) _ Blocked by snow berm for cross country skiing at MP 0.00. It's off-road Snopark vehicle area is plowed open. 3065 Road (Twin Lakes) _ Blocked by large snow berm barrier at MP 0.01 the DOT driveway. Snowmobilers are going around. There are restrictions on snowmobile operation in the Swamp Creek Basin. 3060 Road (Welcome Pass) _ Blocked by 1.5 feet of pack snow at MP 0.00, but the eastbound highway turnout 100 yards to the west is plowed open for parking. 3050 Road (Excelsior Trailhead Parking) _ This off-highway loop is plowed open to bare pavement by WSDOT with parking available, trail is snow covered from takeoff. 33 Road (Wells Creek) _ Partially blocked by a snow berm with road closure sign in the breach at MP 0.00. Do not block the opening in the berm. The highway turnout is plowed open to bare pavement for parking for those wanting to walk down the snow-covered road to Nooksack Falls. Road is gated under seasonal closure forest order at MP 0.60. 3040 Road (East Church Mountain) _ The snow berm is breached at MP 0.02, but rutted compact snow begins immediately up hill. I didn't drive this route. High clearance all-wheel drive vehicles are venturing an unknown distance up this route. 31 Road (Canyon Creek) _ Pavement was bare and dry to first compact snow and ice at MP 0.90 and from there the route had compact or slushy snow rutted to bare wet pavement with limited maneuvering/turnaround potential. I drove the road out only as far as MP 1.80. It is reportedly plowed to the current snowmobile staging area at MP 5.70, the gate site. Expect icy compact snow on the route at the slope aspect transition at about MP 3.90. Sno-park permits for terminus parking are required. All roads off the 31 mainline are currently snow-covered and closed or are designated for snowmobiling. 3120 Road (West Church) _ Snow-covered, gated at MP 0.20. currently closed to motor vehicles by forest order until April 15. 37 Road (Deadhorse Creek) _ Not plowed, slushy, compact snow starts at MP 0.00.but road is being driven an unknown distance. Not recommended for two-wheel drive, low clearance vehicles at the moment. 39 Road (Glacier Creek) _ Bare-rutted, slushy compact snow begins at MP 0.00. The current snowmobile staging area snopark is at MP 0.90 the Thompson Creek bridge, but the 'no-wheeled vehicle beyond this point' sign is now missing perhaps signalling a move uphill for snowmobile staging. Not recommended for two-wheeled drive vehicles at the moment. All roads beyond the 3910 Road off the 39 mainline are currently snow-covered and closed or are designated for snowmobiling. 3910 Road (Thompson Creek) _ Plowed open from MP 0.00 to compact snow and ice running surface up to the residential in-holdings. Running surface can be rough. 38 Road (Middle Fork Nooksack) _ Snow-free from MP 0.00 (Mosquito Lake Road) to about MP 1.50 where patchy, rutted compact snow and ice begins. Expect industrial traffic weekdays. Condition above the 6.5-mile not known." Would love it if you update this as lower elevation snows melt. 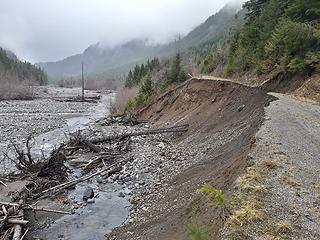 Yesterday, Sunday 4/7/19 Wells Creek Road FR 33 above Nooksack Falls is washed out about MP5. There's a faint, new game trail-like bootpath above the landslide that's steep at first above the road. 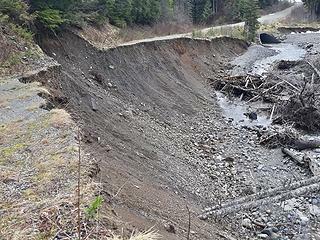 The landslide is just before the nice big culvert with a tall waterfall upstream. It was a short but dicey bushwack to the waterfall with 2 cold creek fords. The landslide looks very expensive and difficult to repair. The whole roadbed is gone down to the creek and its wide. I'm not optimistic about us driving to Cougar Divide this summer. That washout has been there for years. Was the gate open? Wells Creek Rd is still gated. Repairs are in the plans. I have a new road report, I will share when on my laptop in a bit. Real bummer, cougar divide is one of my favorites. The Mount Baker Highway was bare and dry though Glacier all the way to the base of the hill near Shuksan. Shoulder snowplow berms are 95 percent gone, but there is still patchy snow on the forest floor along the highway east of Nooksack Falls. The highway above Silver Fir is reported bare but wet in places onto Heather Meadows. The USFS/NPS Public Service Center is closed now through April into the beginning of May. If you want to get a firewood cutting permit email Magenta Widner (mwidner@fs.fed.us), she will make an appointment with you on a weekday at the Glacier office to issue one. In April you also can go to the district office in Sedro-Woolley weekdays during business hours for one. District north end roads and recreational facilities were found as follows during the March 29-31 from up-valley down. 3075 Road (White Salmon) _ Not checked, but reported snow-covered with the Salmon Ridge Snopark upper parking area plowed open. The last trail grooming of the season was scheduled for March 31. 34 Road (NF Nooksack) _ Open and passable to road end Nooksack Cirque Trailhead parking at Ruth Creek with minor wood litter. Roadbed has some rough patches but can be driven by low clearance vehicles. Recreation note: dispersed camping area at beaver pond is snow-free and accessible. Ruth Creek is very low at the moment but the channel has shifted below the old bridge crossing. No snow visible on trail east of the creek. 3070 Road (Razorhone) _ Gated and closed at MP 0.06, until about May 1. Lower Salmon Ridge Snopark is almost completely melted bare. Recreation note: The road portion of the ski trail had only a skiff of snow-cover remaining just beyond the gate. 3071 Road (Anderson Creek) _ Only a thin layer of compact snow remains at take-off (MP 0.00). But road gate will remain closed and locked due to impassable washout at MP 0.90. 3065 Road (Twin Lakes) _ Open, snow-free and passable from WSDOT facility driveway MP 0.00 to remnant pack snow at MP 1.99. There are several passable deadfalls. Running surface is rough above the one-mile. 3060 Road (Welcome Pass) _ Take-off is snow-free, road is clear passable to a blocking 22-inch wind-throw at about MP 0.30. There's no turnaround at the barrier and roadbed is extremely rough and a high-center hazard for low clearance cars exists 100 feet downstation. Road is snow-free above the downed tree. Parking is recommended at several pullouts around 0.20 until blockage is breached. 3050 Road (Excelsior Trailhead Parking) _ Paved parking stalls and driveway are snow-free and trail take-off is bare as well. Unknown how far up the snowpack currently is on this route. 33 Road (Wells Creek) _ Snow-free and passable downhill to Nooksack Falls parking areas and up to the gate on the south side of the bridge at MP 0.60. Do not block closed gate which is locked under a forest order for seasonal wildlife closure. Recreation note: road is snow-free above the gate an unknown distance for hiking and biking. 3040 Road (East Church Mountain) _ Open, snow-free and passable to a blocking duplex of 24-inch wind-throws at about MP 1.99 (Church Mountain Trailhead is at MP 2.69). Fossil Creek ford at MP 1.69 is somewhat rough but passable for low clearance vehicles. Recreation note: Road is snow-free into trailhead and the footpath is snow-free an unknown distance upslope. 31 Road (Canyon Creek) _ Open, snow-free and passable to first snow-cover at about MP 9.90. Snowmobilers are departing from the Whistler Creek Road staging area. Gravel surface above MP 7.90 is rough in places. 3120 Road (West Church) _ Gate is closed and locked for seasonal wildlife habitat protection until April 16 at MP 0.20. road is snow-free up from take-off. 3140 Road (Canyon Ridge) _ Not driven this survey, but was snow-free at take-off from Canyon Creek Road. Road (Deadhorse Creek) _ Snow-free and passable with difficulty (see below) to remnant pack snow patch at MP 8.10 _ the upper Deadhorse Creek bridge. By clicker counter 1,255 chuckholes were tallied between MP 1.00 and 4.85. All vehicle operators should proceed with caution on lower Deadhorse Creek road. There is significant risk of undercarriage damage to low clearance vehicles and suspension damage to all vehicles below the 4.85-mile. The now bare 9-mile section of this route also has 21 breached large wood debris stations including two overhead clearance (low hanging windthrows). 39 Road (Glacier Creek) _ Open, snow-free and passable to first remnant snow patched at MP 5,70. Snowmobiler are staging as high as the 6.6-mile. 3910 Road (Thompson Creek) _ Plowed open from MP 0.00 to compact snow and ice on the running surface above the residential in-holdings. Running surface can be rough. 38 Road (Middle Fork Nooksack) _ Snow-free from MP 0.00 (Mosquito Lake Road) to about MP 10.30 where patchy, rutted compact snow and ice begins into the Elbow Lake Trailhead. High clearance four-wheel drive rigs are venturing upstation from MP 11.60 probably as far as Ridley Creek Trail spur at MP 12.30. Expect industrial traffic on the Middle Fork Road (below the 6-mile) weekdays. Above the 6-mile stare timber sale spur, there are 335 chuckholes but winter wood debris is sporadic. Remember, too, that avalanche hazard can continue into early summer below the timberline here and though avalanche chutes above upper 32 Road (Hannegan Pass) appear to be empty at the moment, they can reload with April and May snowstorms. Risk remains there and in all off-road back-country areas especially above 3,000 feet. Check the Northwest Avalanche Center _ https://www.nwac.us/ _ for latest conditions. Also WSDOT has announced an upcoming paving project slated for later this spring on Mt. Baker Highway from Bellingham east. Mine too. I am thinking of doing a hike/bike this year up perhaps as an overnight. I want to make sure the trail stays brushed out. Recreation note: road is snow-free above the gate an unknown distance for hiking and biking. Snow started just after culvert and washout near MP 5. Maybe a few inches deep but melting fast at that elevation. Covered the road for about 200 feet length then bare again. I didn't go much further than MP 5.5 last Sunday.